So today I was talking to a couple of friends, and we were talking about focusing on finances this semester and some ways to stretch our tiny college budget just a bit farther. One of the guys (a business major, of course) came up with the idea of carrying more cash and less plastic, which was something I had never really considered! So I went home and did some research, and would like to share with my fellow smart-shoppers what I found and the conclusions I have come to on the benefits of carrying cash. Statistically, about 60% of active credit cards are NOT paid off monthly. Americans rely constantly on their credit cards, and while they can be useful, they can also lead to impulse buying and overspending. Even debit cards don’t require you to LOOK at a price before swiping – you can spend a hundred dollars without hardly thinking about it. It seems that the best way to put the overspending to a stop is using cold, hard cash. 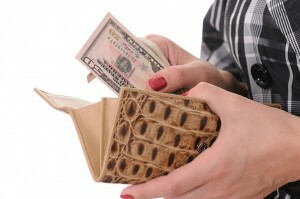 Cash has been disappearing from many American wallets as the plastic cards take over. But, by using cash only, it puts a set limit on spending. Example: weekly grocery shopping. Before you go out, take time to make a list of the things you need for the week and their approximate prices. Then, take out the necessary cash to buy the groceries and the groceries only. This way, when you’re walking down the snack aisle and those Twinkies are staring you down, you know there’s only $50 in the wallet and an extra box of Twinkies would put you over the spending limit. So you graciously back away from the Hostess aisle and continue shopping from the list. Crisis averted. Luckily, using cash helps most on a weekly basis. When a person is limited to a certain amount of spending each week, it is known that they are more likely to be cautious about daily spending habits. Unlike a hypothetical limit that is set with using credit cards, cash actually limits spending. The only thing is sticking to the plan. It’s the easy way out to run out of cash and reach for that card. But, trust me, if you can stick with it, the money savings will be worth every penny. I’ll be the first to admit, this savings plan won’t be easy, especially if the card has become a splurging habit. Try starting out small by keeping a set amount of cash in your wallet every week. Soon, you’ll find that there might even be a few extra bucks at the end of the week as you’ve become more and more cautious about your spending habits.